A website designed in collaboration with A Practice For Everyday Life for artist Haroon Mirza’s o/o/o/o solo show at the Lisson Gallery in London in 2013. Mirza is best known for his sculptural installations that generate audio compositions. The website replaces the traditional exhibition catalogue and creates an experience that evokes the live exhibition and asks the audience to join in. A plain visual style is used for the site, in keeping with the raw aesthetic of the artist’s work, but this simple framework belies something more complex – a sound sample sequencer for desktops and touch-screens. 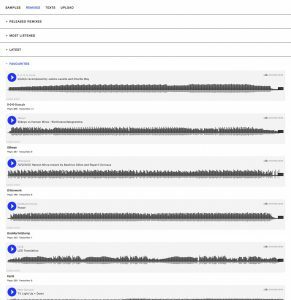 Despite its simple appearance the website uses a number of what were then new web APIs and elegantly works around the technical limitations of iOS devices by allowing multiple simultaneous audio streams playback. Full integration with Soundcloud API allows visitors to play with samples from Haroon’s work. They can rearrange and duplicate them the samples on site, creating personal remixes that can then be uploaded. Remixes from Haroon’s sound samples were created by Factory Floor and Django Django.